4. Rewind unit adopts four shafts turret exchange system to save time and material waste. 5. 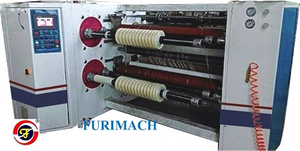 Machine adopts surface type passive rewinding and rubber roller pressure is adjusted by precision regulator. It’s by constant tension control without bubble or wrinkles. 6. Unwind unit adopts motor driving; feeding speed is controlled by floating roller. Low friction cylinder controls floating roller tension to ensure unwind tension is constant. 7. Machine guiding rollers use mirror treatment to avoid any scratch. 8. Waste collect system can choose left-right moveable surface rewinding type, servo motor control center rewind type and blower fan collect type. 9. Slitting blade can use air blade, shear blade, razor blade for different material slitting. Max. unwind O.D. 600mm Core I.D. 3 "/6"